1) Clean the truffle with a soft brush; don’t wash it! Beat the eggs, half-and-half, salt, and pepper together in a heat-proof glass bowl until combined but not frothy. 2) Shave the truffle into the egg mixture with a truffle shaver or mandoline. 3) If you have time, cover with plastic wrap and allow to sit in the refrigerator for a few hours. The eggs will become more infused with the flavor of the truffle. 3) When ready to serve, set the bowl over a saucepan of simmering water, making sure the bottom of the bowl doesn’t touch the water. Cook over the water, stirring occasionally with a wooden spoon, until the eggs are thick and custardy. This will take about 20 to 25 minutes. Remove from the heat immediately. 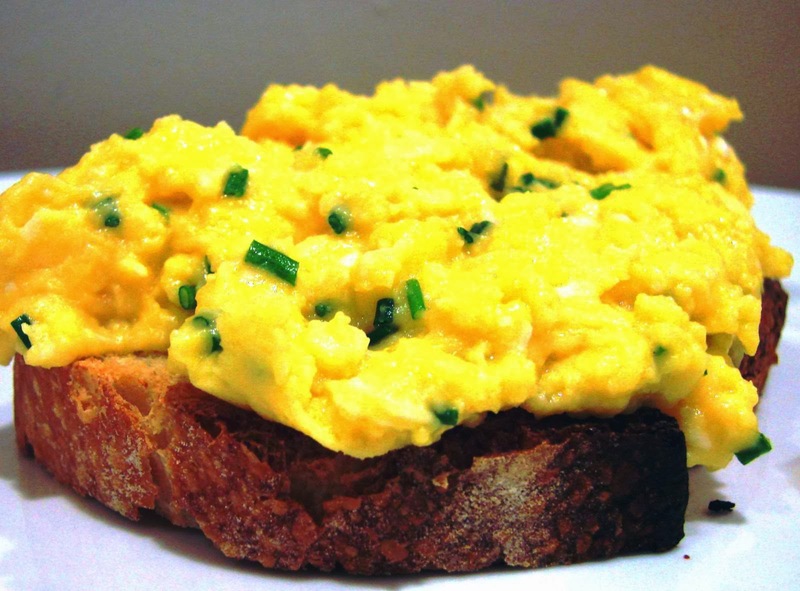 4) Place two toast points on each plate and spoon the cooked eggs on top. Serve hot. a) Black truffles are French and white truffles are Italian; don’t even think about using the canned ones. b) These will be creamy when done. Cook until a spoon stands up in the middle. 1) In a bowl, whisk the eggs and water;. 2) Melt 2 tablespoons of the butter in a large stainless steel bowl set over a pot of simmering water; Add the eggs and cook over low heat, gently stirring with a heatproof rubber spatula and scraping the bottom of the bowl until the eggs just begin to set, about 5 minutes;. 3) Add the remaining butter to the eggs, 1 piece at a time, and cook, stirring and scraping the bottom and sides of the bowl, until the eggs are thick and cooked through but still soft, about 5 minutes longer. 4) Season with salt and pepper; transfer to plates. 5) Drizzle with the truffle oil, sprinkle with the chopped scallions and serve at once with the brioche. Master the art of cooking meat at, The Physics of Cooking Meat: Your Quick Guide to Cooking your Favorite Meat. Enjoy your cooking and keep healthy!